Yesterday I shared that I’ve been working to finally (after living here a year) getting my office in order. Because our house is from the 1920’s, closet space is far from vast so I opted to have a combo dressing room and office in the lower level of my house. It’s a bit of a pain to trek downstairs to get ready, but I decided it worth it in order to have my own complete space that I can retreat to. I’m the type of woman that prefers to save up (or break the monthly budget) and get one fabulous item periodically rather than shop often and have a huge wardrobe. I also keep things like designer shoes for many years so that my return on investment ends up very low per wear. I started this habit of less is more (or is it a ‘more’ is more impact scenario?!?) as a teen. I will admit that there were months living in San Francisco when I ate cheap diets of noodles and eggs for a month in order to get a perfect dress or pair of shoes. Funny but I still own things from my teen years and early 20’s so I guess it was worth the marginal food in some cases! I had a good laugh the other day when I realized with a friend that I have owned some shoes for as long as she’s been alive (23 years)!! 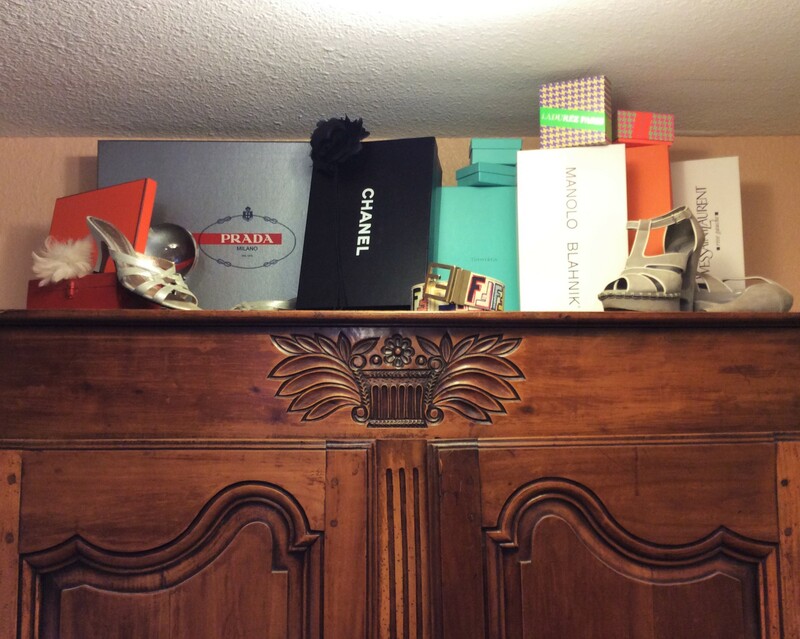 This vignette is on top of my armoire and includes the YSL shoes I wore for my wedding, the Manolo Blahnik box from my very first couture pair of couture shoes (yes, I still have them) and an Hermes scarf box from my first trip to Paris. So there are lots of memories for me in this display and it makes me smile. On the note of memories, if you love fashion, if you’ve never been to the Hermes store in Paris you should put this stop on your bucket list! My vivid memory of the French sales women whipping the scarves open & closed for to view their patterns was both amazing and a of bit hilarious theatrics. I have no idea how they learn to do this in single motion but it’s quite a show!! And doing it while looking so typically Parisian bored and beautiful just adds to the scene. Two of the boxes are from another must visit spot in Paris – Laduree. The 2 little boxes in neon herringbone are from when Steven & I eloped to Paris 3 years ago. Laduree is one of the bakeries that spurred the macaron craze in the US. They’ve been around since 1862 so macarons are far from new for them, and in my opinion, theirs are perfect…crisp and perfectly balanced, bright flavors. The “best” macaron title BTW is a big debate point with Parisians so I may get grief for that statement! Try to create a spot in your house or apartment that offers a quick glance at some mementoes from your life. They need not be designer or expensive items – just meaningful to you. Best to group like things together as collections offer much better impact when together instead of scattered. My daughter has a similar vignette of shells, rocks and sea glass that she’s collected on vacations. There are endless variations for vignettes of course – they seem to be everywhere these days on Instagram – but those that are best include special memories. Happy collecting! Next Article Cool Baroque Sconce!